The StorageQuest iSCSI ONA is an optical archiving solution. It is comprised of an array of Blu-Ray optical drives managed by a Windows-based user interface(installed on a separate server). Fast to setup and deploy. Easy to integrate. Each optical drive is accessible from the front of the system and can be easily serviced. 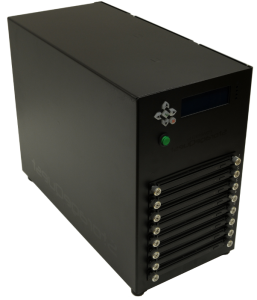 The rack mount version has a redundant power supply and can accommodate up to twenty optical drives. The desktop version is compact, whisper quiet and can accommodate up to eight optical drives. Each model includes the StorageQuest Archive Manager (SAM) software. Archive I/O can be performed one of three ways. 1) Push: That is by use of virtual volumes accessible from the network. 2) Pull: SAMServer monitors a path on your network. 3) Custom integrations. (Call for more detail). 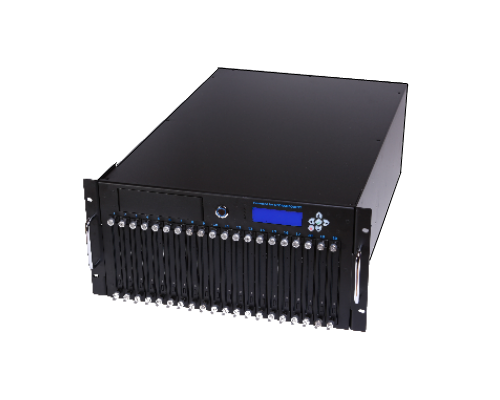 The SAMServer allows for parallel archiving of eight blu-ray discs on the desktop model or 20 on the rack model. The StorageQuest SAMServer was designed to be installed in demanding enterprise environments where downtime must be keep to a minimal. No impact drive failures - If a drive fails in the field, the unit continues to operate and all other discs are still accessible. Warm-Swappable Optical Drives - Optical Drives are front accessible and can be replaced while the unit is running. Optical drives can easily be upgraded to the newest available to instantly increase the overall storage capacity. Both models of the StorageQuest iSCSI ONA come standard with 1 year return to depot warranty, telephone/email/teamviewer support from our in-house storage experts. Extended support options are available on request. 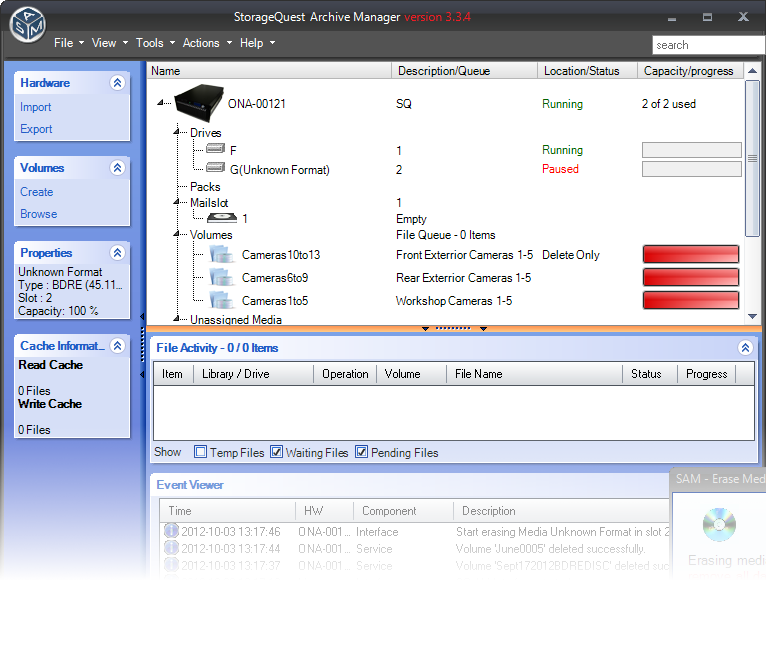 The StorageQuest SAMServer comes with the StorageQuest Archive Manager (SAM) front end. SAM is an archive management application build using today’s leading development tools and technologies. 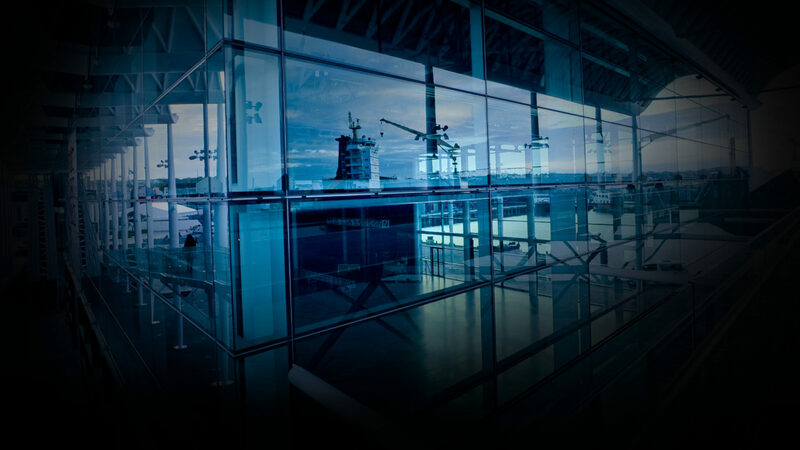 A user-minded Graphical User Interface (GUI) runs on top of mature and widely deployed control modules to create a full fledged flexible, powerful, and automated archive manager. Interested? Want to see a live 30 min web demonstration for yourself and your team? Supply your email below and we will get back to you within a day to schedule the demo.